2. If the sketches are sent by mail or by a third party, a copy of the applicant’s Hong Kong ID card is required. 3. Please do not write any name or personal information on the sketch boards. 1. The Hong Kong Young Fashion Designers’ Contest is a fashion design contest realized in the format of a fashion show. 2. Contestants will submit sketches for a preliminary judging by a panel whose members include the Chairman of the HKTDC Garment Advisory Committee and industry practitioners. 3. Shortlisted contestants will need to prepare four sets of fully accessorized garments based on their design sketches for the show to be staged during the “CENTRESTAGE” (4-7.9.2019). Prize presentations follow. 4. The collections will be presented individually in order to keep their distinct identity. Designers may suggest the styling and model sequence. The Council’s appointed show producer has the absolute discretion in music selection and overall show presentation. 1. Contestants must be 45 years of age or under on or before 12 April 2019. 2. Contestants must be permanent HKID card holders. 3. Relevant experience in the fashion design industry is required. In the case of fashion design students, a copy of the valid student identity card must be submitted together with the application form. 4. Each contestant must be sponsored by a Hong Kong clothing manufacturer/enterprise which is prepared to put the design into production. No. 4-7: Individual sketch board - clearly indicating No. 1 to 4, describe in detail the individual design, colors and details mock-up etc. No.8: Fabric swatches/ samples - suggested size not to be smaller than 120mm x 120mm. Presentation should all be done in FULL COLOR on A3-size paper boards (420 x 297mm). Please do not submit 3-D models/ presentation sets. All presentation boards should not carry any names or logos or signatures as to reveal the contestant's identity. 3. The selected designers will be required to submit one set of completed outfit for screening at a Meet-The-Judge session which is scheduled for early June 2019 (date to be confirmed). Outfits that do not meet the Council and judges’ required standard will be rejected. 4. All submitted show garments must be produced in accordance with the original submitted design sketches. Any significant discrepancy from the original submitted designs will lead to disqualification. 5. All entrants and finalists are required to meet the deadlines of entry and show garment submission. Late submissions will not be accepted and the contestants may be disqualified. 6. All finalists are required to attend all meetings, press interviews and photo sessions with both local and international media representatives arranged by the Council. 7. The Council will retain the copyright of all photographs and videos taken of the entries and is entitled without limitation and obligation to use and reproduce the said photographs, video, etc. in any form whatsoever. The Council shall be exempted from any royalty or payment to the entrants or contestants and retain all the rights for showing, publishing and exhibiting the winning and other selected entries at its discretion. 8. While the Council will exercise maximum care in handling all entries, the Council will assume no liability for any damage or loss of any kind. 9. All finalists will be reimbursed for the cost of collection by the Organiser (for up to HK$6,000) against submitting original receipts. The YDC judging panel comprises distinguished industry professionals. Every year the panel is headed by the Chairman of the HKTDC Garment Advisory Committee, who is joined by a group of fashion designers, magazine editors, marketing and retail specialists etc. Past Judges: Martine Rose, MUG, Hiromichi Ochiai, Atsuro Tayama, Veronique Leroy, Margareta van den Bosch, Johanna Ho, Barney Cheng and representatives from D-mop, JOYCE and i.t. Completed online application form must be submitted by 12 April 2019, 23:59 and sketches must reach HKTDC office no later than 17 April 2019, 17:00. *Successful online applicant will be given a reference number. Please quote the reference number when submitting the sketch boards. (2) Submit sketch boards to HKTDC Creative Dept. *For application by mail or by a third party, a copy of the applicant‘s Hong Kong ID card is required. Details of other prize sponsors and awards will be announced separately later. Renowned international designer Mihara Yasuhiro has been invited as the VIP judge. 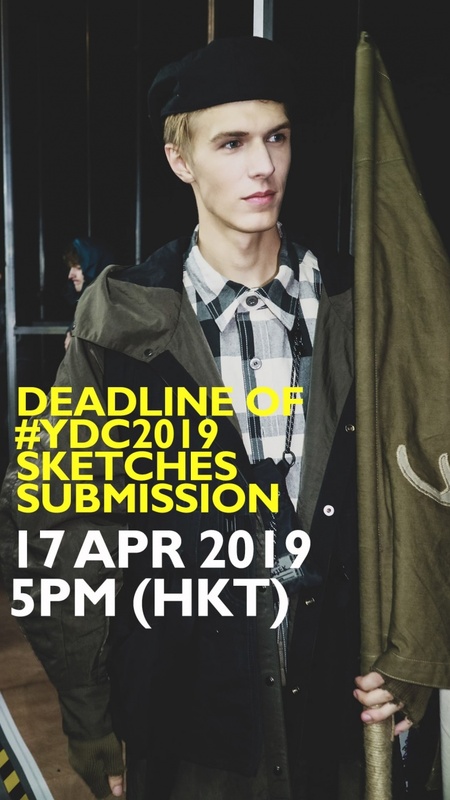 Mr Yasuhira will come to Hong Kong in September and, together with an esteemed panel of judges comprising senior fashion industry figures and media representatives, will help to select the YDC 2019 winners.